years ago. Yes it flies! Designing realistic paper planes (ones that look more like real planes) that fly was something I got into during secondary school, usually at the end of a day when teachers would hand out school notes to take home to parents. Often these notes would be accompanied by long boring monologues by teachers, adding further information. A lot of my notes got folded into paper planes. Just to make it more interesting I set myself a challenge to try and make planes that looked more like actual planes, and they had to 'fly' to be a success. They didn't have to fly well. The just had to fly in a controlled glide of reasonable distance, remaining the correct way up until they landed. One other rule I had was no tearing of the paper. The plane had to be folded from a single sheet of paper. 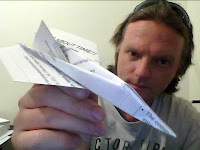 I've designed several working paper planes along with a series of 'conversion' folds that can be applied to a couple of standard planes that'll turn them into more realistic looking planes that still fly reasonably well, even outdoors. I used to even have a website complete with folding instructions. With the above in mind, imagine how cool it was to me to come across someone who has made a Lego Technic, Paper Plane Folding Machine. See the video below. Granted the paper plane it makes is one of the worst paper plane designs ever (isn't heavy enough in the nose section to really fly well) but still, it's very cool. I think I just found a new challenge with my own Lego Technic bricks... make a paper plane folding machine for a better design of paper plane. That would be quite a challenge! Now, now, you haven't got time to play around with Leggo and paper aeroplanes! Would be a change from all the computer stuff though - a sort of 'time out' recreation!